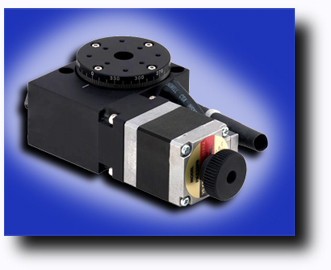 Motion Control – Motorized Rotary Stage, the AR39-AH Available from OES! Van Nuys, CA —– Motion Control – Rotary Stages – A rotary stage is a component of a motion system used to restrict an object to a single axis of rotation. The terms rotary table or rotation stage are often used interchangeably with rotary stage. Our rotary stages provide accurate positioning performance in a low profile and compact footprint. They are perfect for the limitations and requirements of the laboratory and are also used in manufacturing environments. These stages are ideal for optics, measurement, alignment and other demanding applications. The series of rotary stages provide precise motorized rotational adjustment over 360°. The rotation stages provide precise and fine rotation for system assemblies. One can rotate the stages smoothly and continuously by a motor through a full of 360°. These rotary stages incorporate a precision worm-gear drive mechanism and bearing components for accurate positioning performance over the lifetime of the product. About OES – Optimal Engineering Systems, Inc. (OES) is a manufacturer of motion control products including:Stepper motor controllers and drivers, solenoid electronics, and positioning stages and slides. Applications include: Animation, automated assembly systems, automation, CNC machines, flight simulation, inspection systems, linear and rotary stages, machine tools, medical devices, motion control camera boom systems, optical comparators, CMMs, pan-tilt gimbals, PCB assembly & inspection, pick-and-place, positioning stages, robotics, scanners, security cameras, telescope drive mechanisms, time-lapse photography and winders. Some of the industries OES serves are: Aerospace, Astronomy, Chemical, Communications, Educational Institutes, University, Colleges, Government Agencies, National Labs, Manufacturing, Medical, Metrology, Military, Motion Control, Museum, News Agencies, Semiconductor and Test Equipment. Optimal Engineering Systems, Inc’s. competitive advantage is its state-of-the-art in-house manufacturing facility in North America enabling OES to supply clients with custom designed orders or high volume just-in-time deliveries globally.